There seems to be more and more scams than ever before. We get them on our telephones, emails and random pop-ups and links online. Just the other day my wife got a pop-up scam on her computer. She clicked on what she thought was a news link, and up popped a notice saying she had a virus. I myself have received phone calls from someone claiming to be from Microsoft and that I had a virus on my computer. And of course there’s the email scam. First I want to tell you about the pop-up that my wife got. It popped up without warning. The fake news link was a link to the scam, and it came with a voice. (I don’t know what it said. I couldn’t understand the voice.) It had a phone number and a code to tell the operator. A little closer look and you’ll see it’s clearly a web page. Near the first of the year she got another pop-up saying she had a virus on her Windows computer. One problem. She wasn’t using a Windows computer. This pop-up was also a website. Looking at the web address, I went to their home web page. I decided to call the phone number. The woman who answered was very nice and polite and professional. She also wanted access to the computer. For fun, I played dumb and pretended to not know anything about my wife’s laptop. The woman was clearly getting frustrated, but was determined to get into a Windows computer. No way I was going to tell her that it wasn’t Windows. She finally wanted me to tell her what operating system I had. That’s when I hung up. One day I answered the phone and the man on the other end said he was from Microsoft and he’s calling to inform me that I have a virus on my Windows computer. I answered back, “Really? What if I told you I work for Microsoft? And what if I said I work in the Anti-Virus Division?” He then hung up. One more example. Another day someone called claiming to be from Microsoft. Unfortunately I answered the wrong phone and had trouble understanding him. For those who don’t know, I do have a hearing problem. If I was on the other phone maybe I could have fun with him. But as it was I couldn’t understand him, so he hung up. I guess it’s too difficult to scam someone who can’t hear. Years ago I was talking to a policeman and he said to never agree to anything, and never give out any information over the telephone to anyone you don’t know. He said even if they said that they, themselves were from the police department, give them no information. I’ll go one step farther. Even though I am an American, I once dealt briefly with the Canadian Army. Their policy was zero information. You could ask them what color is their army truck, and they wouldn’t tell you. Their thinking seems to be any collection of information could be built up to real intel, and therefor may become a national security risk. For any pop-up on your computer claiming you have a virus, check to be sure whether or not it’s really your anti-virus or a website trying to scam you. Years ago I had a laptop with Windows 7 with Microsoft’s own anti-virus, Security Essentials on it. 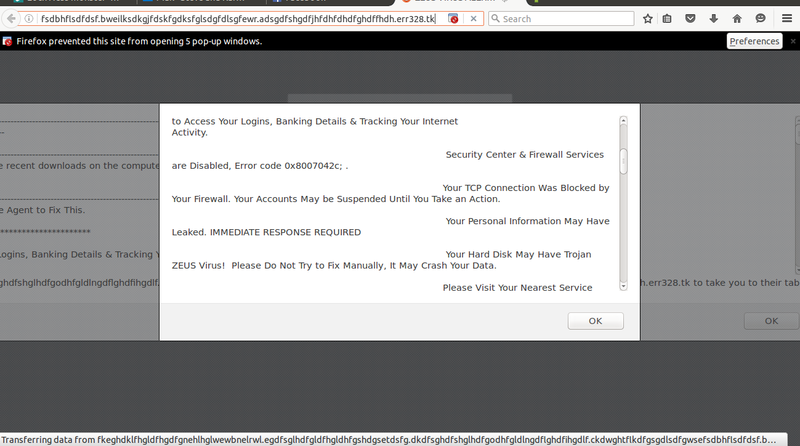 A notice popped up claiming to be Security Essentials and that I had a virus. I clicked on it to remove the virus when the real Microsoft Security Essentials popped up said this is an unknown program. Then it’s asked if I really wanted to install it. I took a closer look at fake Security Essentials and noticed that it had a grainy look to it. While the real one had a very clear and crisp look to it. I then realized I was about down load a virus. I then used the real Security Essentials to scan the laptop and to remove any viruses that may be there. So, pay attention. Is the virus notice real, or is it a website? Does it have a grainy low quality look? Are there misspelled words? Is your computer up to date? Is the operating system up to date? How about all the software you have, like Office? Is your anti-virus up to date? Be careful and please give out zero information. And pray for protection.